You won’t see another lake in Alabama like Lake Martin. It is situated near the town of Alexander City in mid-eastern Alabama on the lower Tallapoosa River System. Impounded in 1926, this huge, sprawled-out lake, has withstood the test of time with fluctuating water levels (down over 10 feet this past winter) and deteriorating wood and bank cover. Fishing pressure has risen to, with major weekly bass tournaments now evident year round. Added to that, there is a growing number of residents that line its banks from Wind Creek State park downriver, all the way to the lakes lower dam. Even with these negatives the lake still has a huge number of bass and plenty of places to fish for them. Shallow, stained water flats (that heat up faster than the much deeper and clearer water found from mid-to-downlake areas), can be found in the mid to upper lake regions. This is generally from Wind Creek all the way to the lakes headwaters. This includes rock islands, old exposed roadbeds, incoming creeks, small cuts, pockets and main-lake flats, all visible during March, late winter pool. During March concentrate your efforts on first and secondary points that lead into calm, spawning backwaters. A bottom composition of either a hard, red-clay bottom, sandy or small pebble bottom, are often the choice spawning grounds for both species of largemouth bass and spotted bass. low-to-mid-60′s, bass will hit mid-diving and deep-diving crankbaits. Excalibur’s Fat Free Shad and Cordell’s Super Spots, Spro’s soft and hard jerkbaits and their Crankbait 25 series all cover these points fast and often get the anxious feeders. 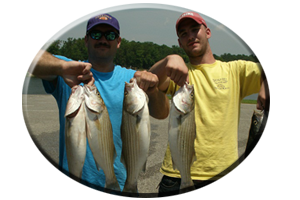 A stop and go presentation with these lures may be needed for sluggish bass or for bass that follow your lures. Up on the points, under cloudy skies, usually when fishing with spinnerbaits and buzzbaits, always generates a few strikes. 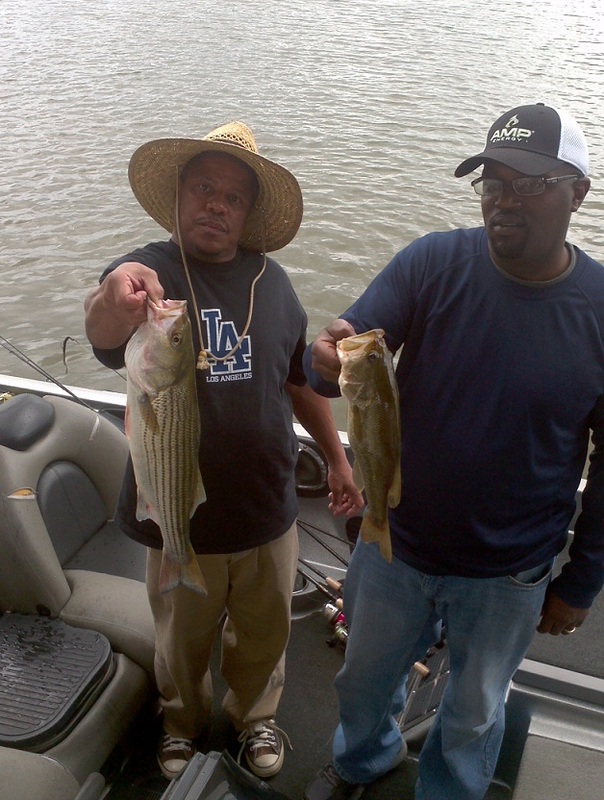 Points with scattered boulders often hold schools of big bass. 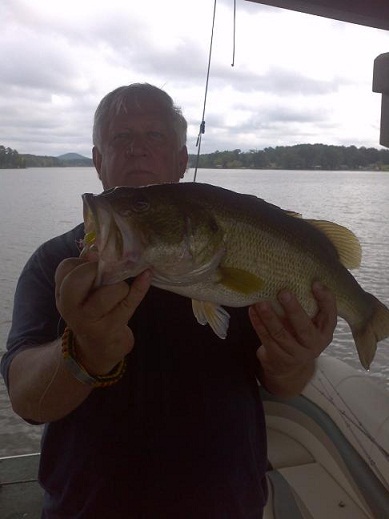 There are some big largemouth bass caught at this time fishing upriver on Lake Martin, many bass taken in these lake headwaters are some of the years biggest bass. 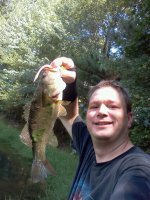 By keying in on lay down trees, brush, stumps and other wood cover, an angler can join this growing list of fortunate trophy bass anglers. Flipping jigs with pork trailers is the big bass lure on Lake Martin. Many model jigs are made right here in Alabama. 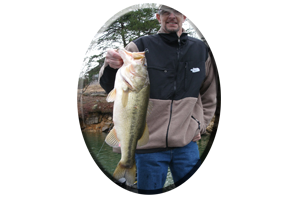 Texas or Carolina-rigged plastics, jigging spoons, fishing with small finesse lures, crankbaits, jerkbaits, spinnerbaits and various topwater lures, are all suited to the lakes stained headwaters. Or when in clear water try natural colors. These are better suited for the much clearer water found from midlake to downriver on Lake Martin, during these prespawn times. Small jig heads adorned with smaller plastics like worms are great on Lake Martin’s spotted bass population. During April on Lake Martin many changes take place as bass are full swing into that spawning thing. First, is the availability of prime spawning grounds (of which Lake Martin has plenty of) and nearby spawning cover, of which is often lacking. The Alabama Power Company plants brush cover every year and there are resident-planted brush piles, natural rock piles, piers, boat houses and floating docks, that all provide some cover. This is especially true during pre-spawn times, when bass hold around cover in a little bit deeper water. But during the spawn, the very shallow, spawning grounds of the largemouth bass (and some spotted bass) are often void of cover. Never fear, for as the month of April goes on and bass seem to inhabit every little shallow water object for security and ambush spots, the lake level will be rising, creating more cover opportunities. All the previously exposed rock piles, rocky points, stump rows, lay downs, brush piles and other wood and rock cover, you’ve observed for the last six months, will now be submerged. This cover can now be found in 1-10 feet of water, as the lake returns to full pool by May. If you have done your homework in March, you should have triangulated these spots, marked them on a GPS unit, or marked a map with detailed directions. This will aid you in getting back to these now underwater, hidden hot spots, during spring. During clear-to-lightly stained water conditions, with normal low-to-mid seventy degree water temperatures, around a full moon, most bass will be bedding by late April on Lake Martin. 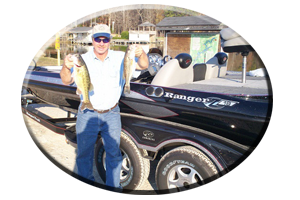 Utilizing a good pair of polarized sunglasses and while cruising the shallows with the trolling motor on constant low, you can spot these beds, both upriver and especially downriver in the lakes shallow waters. Often you can sneak up on some huge female bass and many anxious bed-protecting males. These are easy-to-catch bass at times. So practicing, catch and release on the part of the angler, is a must. Remember, these are crucial times and returning the fish to the spot you caught it in assures two very important aspects in the reproduction of our lakes bass population. 1. Returning the male bass (usually the smallest) to the bed, to spawn or to protect newborn fry, assures future generations of bass. With the male there to protect the newborn bass throughout the weeks of them growing up in a strange, new world, survival is more likely. 2. Or in the case of a huge female bass, of which can lay over 10,000 eggs. Being returned to the bed, you could be saving thousands of future generations of bass. One female bass can produce over one million offspring during its expected lifetime here on this earth…that is, if we let them. 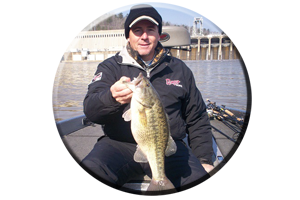 In April, bass are at three water levels from 1-5 feet and will hit a variety of lures both upriver and downriver on Lake Martin. During early light periods or during cloudy, overcast days and late evenings, these bass will hit topwaters, in line spinners, jerkbaits, lipless lures and crankbaits. 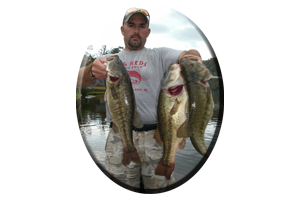 Bedding bass will hit small worms, lizards, crayfish imitations, jig combos, grubs, tube baits, creature baits and a number of other bottom fished lures. Long cast’s and using light line will help you fool these often very spooky bass during these clear water situations. Remember practice C P R this spring (or any time) when catching these bass. Catch, Photo & Release. As Lake Martin returns to full pool during May, many bass are in less than five feet of water lake wide. Most bass have spawned by the first week of May and some big female bass are found feeding and recuperating, in or near the shallow spawning grounds. The availability of baitfish now determines the location of schools of post-spawn bass. This is also the beginning of a summertime feeding trend, that will last for the next 3 months. Targeting these schooling bass with lures such as jerkbaits, rattling lipless lures, crankbaits and topwaters, can bring fast and furious action all summer long. Look for baitfish skipping across the water’s surface or bass schooling on top. These are signs of bass down below. Get a lure to em’ fast, for they often vanish as fast as they appeared. Experiment this spring, not only with your lure presentations and lure color choice, but be selective with lure choice to. For the month of May is the time a bass will hit any lure in the box. Also keep in mind during these three months of spring, that bass will often be in a post-spawn mode upriver, coming off the beds, while lower lake bass could still be spawning. As lake levels again return to normal, full pool levels, with newly flooded shallows, many bass will forage in the often stained water. As spring slowly comes to an end look for early summer bass to gather in the backs of feeder creeks and near the lake’s headwaters, relating to wood cover, rock cover and cooler water, as they come off the beds. Flipping, pitching or just casting worms, tube baits, lizards and jig combos, now gets the big bass bite from hungry, post-spawn largemouth’s and some aggressive spotted bass, all found lake wide on Lake Martin this spring season.